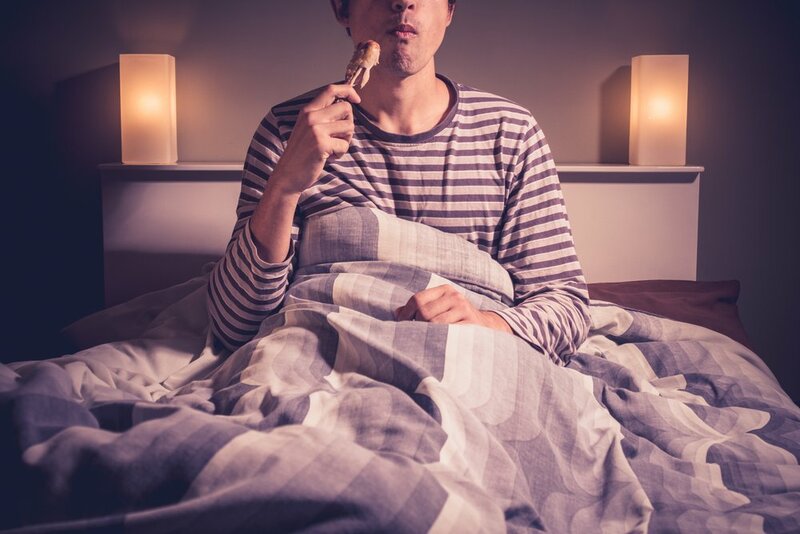 If you’ve ever snuggled up with a snack in your bed, you certainly aren’t alone – a recent survey conducted by British website Made.com revealed that about 25 percent of people regularly eat in bed. And while the idea of eating breakfast (or lunch, dinner, and snacks) in bed might sound like a fun scene out of your favorite movie, it’s a bad habit you should avoid. Odds are, you’ve read plenty of health articles about sleep – so you already know it’s important. But, have you ever thought about the little things you can do to improve your sleep health? If not, now’s the time to start. Here are three good reasons that you should stop eating in bed today. Good sleep and health go hand in hand, so it makes sense that you should want to do everything possible to get a good night’s sleep, every night. However, with more and more people adding outside factors like television and food into their bedtime routine, it’s not surprising that many people are reporting terrible quality of sleep. When you do activities other than sleeping in your bed, like eating, watching television, or browsing the Internet, your brain begins to associate bedtime with more than just sleeping. This can lead to insomnia and seriously disrupt your normal sleep routine. If you’ve ever purchased a mattress, you know that it’s no small investment. And yet, eating in bed means that you’re endangering your mattress (and sheets), with spills, crumbs, and the resulting bacteria growth leading to a shortened life. No matter how carefully you eat in bed, you’re going to drop a few crumbs here and there. In doing so, you may as well lay out the welcome mat for ants, roaches, and a whole range of pests that you don’t want in your bed. Keep your food in the kitchen where it can be easily tidied up, and you can avoid unwelcome creepy crawlies. If you’re looking for other ways to improve your quality of sleep, a new mattress or sleep accessories might be just what the doctor ordered. At MATTRESS360, we offer a range of high-quality mattresses in a variety of styles so that you can find the perfect match for your sleep style. Because the MATTRESS360 team believes that good sleep health should be attainable for everyone, we offer financing options and the best prices in the Valley. Come to our showroom today, and we can help you learn more about how you can maximize the health benefits of sleep. Visit Our Resource Center to Learn More About Mattresses and Bedding Accessories!